Western Pleasure Guest Ranch offers fresh mountain air and amazing views for their guests to enjoy. This all-inclusive ranch offers guests the opportunity to stay in lodge rooms or cabins while having access to all ranch amenities and activities. Family owned for four generations, this ranch strives to give their guests the full dude ranch experience while they rest and relax from their daily grind. Western Pleasure Guest Ranch offers several cabins and a Grand Lodge for guest accommodations. Each of these cabins come with their own unique designs and offer guests all the amenities they are seeking when on vacation. The Meadowview Cabin offers guests a view of the beautiful meadow where cattle and horses spend their time grazing. With a river rock fireplace, privacy, and open floor plan this cabin is both spacious and homey. For families, a lower level with two full beds and a half bath is available. With amenities such as specialty sheets and towels, private bathroom, refrigerator, microwave, four burner stove, toaster, coffee pot, hair dryer, half bath, wrap around deck, handcrafted quilts, complimentary soaps, and available wood and kindling. The Settler cabin has the bonus of being near the Grand Lodge. A cozy cabin with beautiful décor, The Settler offers a private queen bedroom on the main floor and an open loft upstairs that features a queen bed and two twins. Great for bringing the family, this cabin also features all the amenities you could need such as specialty sheets and towels, private bath, refrigerator, microwave, four burner stove, toaster, coffee pot, hair dryer, half bath, wrap around deck, handcrafted quilts, complimentary soaps, and available wood and kindling. The Wrangler is a spacious cabin that offers guests a trip back to the old west. This cabin offers a private bedroom on the main floor featuring a queen bed while upstairs a loft with a queen bed and two twins are waiting. This cabin features a private bath and free-standing wood stove. The Wrangler also offers all the amenities needed such as specialty sheets and towels, private bathroom, refrigerator, microwave, four burner stove, toaster, coffee pot, hair dryer, half bath, wrap around deck, handcrafted quilts, complimentary soaps, and available wood and kindling. 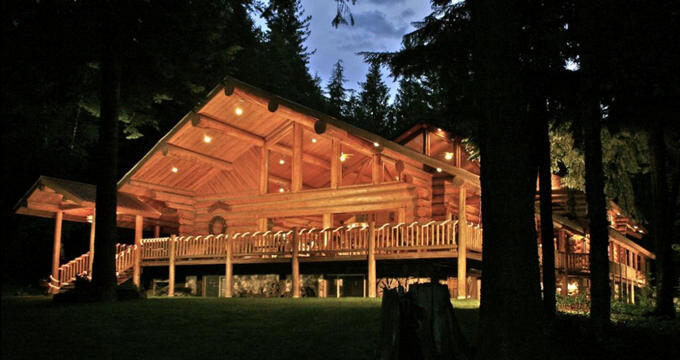 The Hunter Log cabin is the most reclusive of the four cabins offered at Western Pleasure Guest Ranch. As the name suggests, this cabin offers guests the feeling of staying in a hunter’s quarters. A deer antler chandelier and the opportunity to see wildlife outside the window awaits anyone who visits here. On the main floor, a private bedroom features a queen bed. In the upstairs open loft, a queen bed and two twins await. Featuring a standing wood stove, the Hunter Log Cabin also has all needed amenities such as specialty sheets and towels, private bath, refrigerator, microwave, four burner stove, toaster, coffee pot, hair dryer, half bath, wrap around deck, handcrafted quilts, complimentary soaps, and available wood and kindling. In the Grand Lodge, guests will find themselves with the opportunity to choose between several different room types. On the upper layer of The Grand Lodge, The Duke awaits. Named after the man many feels represents the old west more than any other, John Wayne, this room is decorated in honor of his memory. This room features a queen bed and private bath with walk-in shower. Amenities such as hair dryer, luxury sheets and towels, handcrafted quilts, complimentary wireless internet, and complimentary soaps await. Miss Belle offers a feminine touch to your western vacation. This room provides the sophisticated feel of the women of the old west. The comfort of a queen size brass bed and private bath make this room a place to relax and unwind truly. Amenities such as hair dryer, luxury sheets and towels, handcrafted quilts, complimentary wireless internet, and complimentary soaps await. The Nez Perce is named after the indigenous tribe credited for developing the Appaloosa horse. This room offers a queen room and private bath while the hideaway loft offers an extra twin bed for those who need more space. Amenities such as hair dryer, special sheets and towels, handcrafted quilts, complimentary wireless internet, and complimentary soaps await. The Siesta is one of the most, warm, inviting rooms available. Complete with queen bed, loft with a twin bed for children, and a private bath, The Siesta is a great place to unwind after a hectic day. Amenities such as hair dryer, special sheets and towels, handcrafted quilts, complimentary wireless internet, and complimentary soaps await. On the lower level of the Grand Lodge, you will find Grandma and Grandpa’s rooms. Located near the rec room, Grandma’s Room features a queen bed and a cozy, warm, feel. Featuring a window that looks out over the grounds, Grandpa’s Room features both a queen bed and double bed for extra company. Both rooms feature a private back and all amenities needed such as hair dryer, special sheets and towels, handcrafted quilts, complimentary wireless internet, and complimentary soaps await. At Western Pleasure Guest Ranch, guests will receive special activities for different times of the year. Their all-inclusive packages offer a wide variety of things to do. When not taking part in the scheduled activities guests will find themselves with the opportunity to indulge in the many other offerings. Inside the Grand Lodge, you’ll find the recreation room where billiards and foosball can be enjoyed while watching a movie. The Grand Lodge also offers great common areas that are perfect for lounging or simply relaxing such as The Great Room and The Lodge Loft. The Western Pleasure Guest Ranch is a great place to host your special event. Whether planning for a company retreat, meeting, or family reunion the Ranch offers not only the space but will assist you with planning your special event.